Canadian automakers and parts suppliers export up to 85 per cent of what they manufacture to the United States. WASHINGTON -- The border adjustment tax advocated by some U.S. Republican lawmakers has lost a lot of steam since it was floated last summer, with major industries such as automotive and retailing that heavily rely on imports pressing lawmakers to scuttle the idea. But auto suppliers aren't letting up in their opposition, touting a new study that suggests the border tax and other trade policies, such as import tariffs aimed at pressuring U.S. manufacturers to relocate overseas factories to the United States, will harm the auto industry and consumers while undermining job creation and economic growth. Many Republicans on Capitol Hill have expressed skepticism or opposition toward the border tax, but House leaders still are expected to pursue the tax because it is a key revenue raiser that would allow them to offset cuts to corporate and individual tax rates. Under the border adjustment tax, importers would be taxed at a lower corporate tax rate of 15 to 20 per cent, but they would pay tax on the entire value of the sale, without the ability to deduct input costs associated with any part of the import process, as they can today. Exporters, meanwhile, would be exempt from paying tax on their profit. The economics of bringing production work back to the United States aren’t favourable for most automotive products under current market conditions, according to the study by Boston Consulting Group and commissioned by the Motor & Equipment Manufacturers Association. For the North American auto supply chain, a border adjustment tax would add cost to a vehicle but not change the decision on where to manufacture because it still would be cheaper to produce in Mexico, depending on the components or vehicle involved, Xavier Mosquet, managing director of Boston Consulting's Detroit office, said in a briefing for journalists. On average, a 15 per cent border adjustment tax would increase the cost of vehicles in the United States by US $1,000, while a 35 per cent tariff would raise the price by US $1,145, the study said. A 20 per cent tariff would raise average vehicle cost by US $650. Similar numbers for Canada haven’t been calculated. The cost increases would force automakers to pressure suppliers to lower prices, resulting in the removal of three per cent of nonessential parts from vehicles. "Decontenting" would lower supplier revenues and place up to 50,000 U.S. jobs at risk, Boston Consulting said. The decision to take out optional features will begin with customers deciding how much they can afford and streamlining option package choices, said Ann Wilson, the manufacturers association's senior vice president of government affairs. Canadian automakers and parts suppliers export up to 85 per cent of what they manufacture to the United States. And 64 Canadian parts suppliers have 120 facilities that employ 43,500 people in Mexico, according to the Automotive Parts Manufacturers’ Association. On Monday, the Trump administration outlined its objectives for renegotiating the North American Free Trade Agreement with Mexico and Canada. President Donald Trump has suggested the United States could pull out of NAFTA if the talks don't provide greater benefits to American companies and workers, at which time higher tariffs might be implemented. The 35 per cent tariff cited in the study is an extreme scenario and not considered likely by most trade analysts because it could do severe damage to supply chains that depend on cross-border trade. 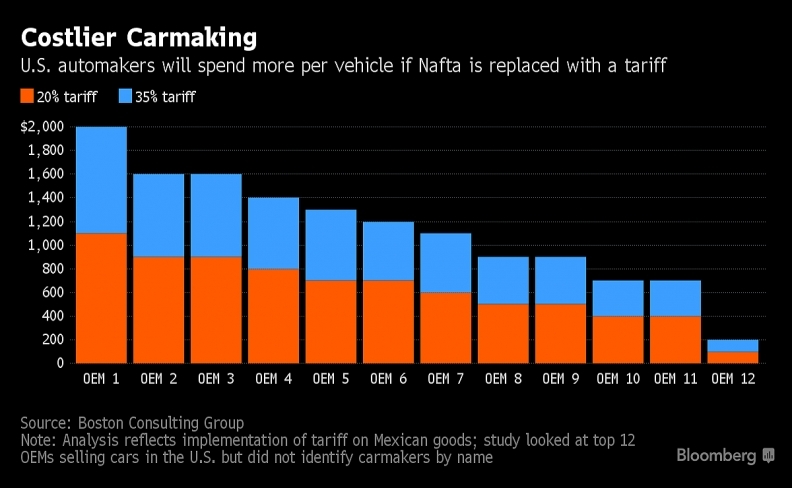 In January, the Center for Automotive Research estimated that a 35 per cent tariff would result in a sales reduction of 450,000 vehicles in the United States and increase average prices there by about US $6,000. Trump has shown a tendency to back down from tough rhetoric when it comes to actual policy decisions, so even if he follows through on a threat to withdraw from NAFTA, the administration is expected to impose much lower tariffs. Boston Consulting also said there isn't enough domestic manufacturing capacity, or available skilled labor, to take on the extra load of overseas production, yet not enough demand for companies to justify investment in plant expansion. 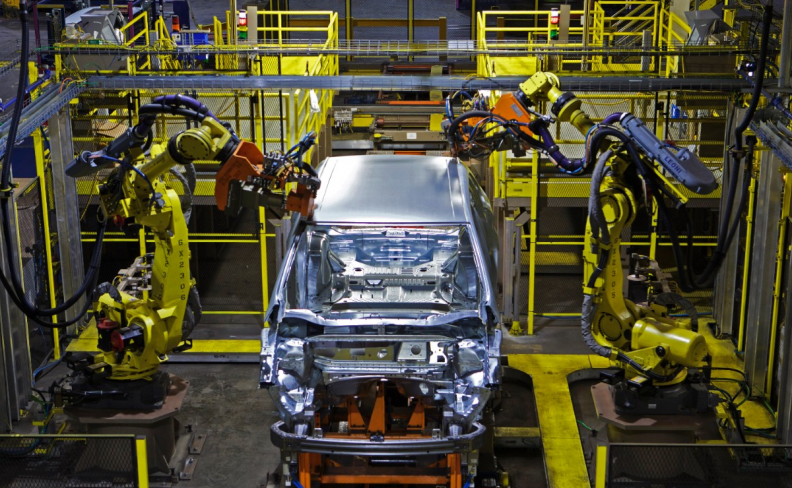 Automaker plants are running above 110 per cent capacity and have limited ability to increase domestic employment without significant capital expenditures. Suppliers face similar capacity restraints. Investment in new capacity would be risky because the automobile market is softening, the study says. Car and light-truck sales hit a new high of 17.5 million last year and are trending below 17 million vehicles in 2017. Investing in freight transportation infrastructure such as highways, bridges and ports. Enforcing trade laws and doing more to protect U.S. intellectual property abroad. Adopting a territorial-based corporate tax system so companies have incentive to repatriate foreign earnings. Supporting apprenticeship programs and increasing focus on career technical education to make sure schools have programs to train individuals not interested in college.